How do I set up a Raised Spot UV job? Raised Spot UV jobs are set up the same way as Spot UV jobs. 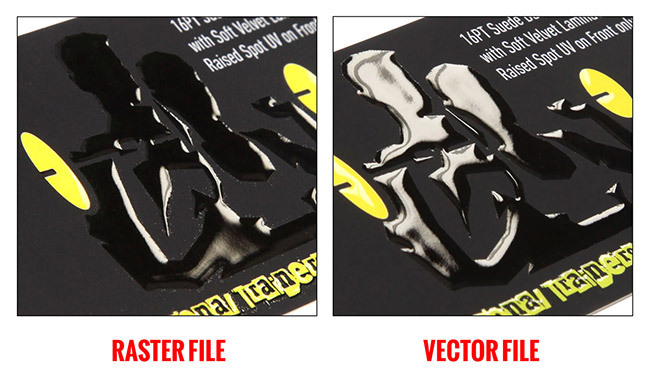 When creating a Raised Spot UV job, you must include a Raised Spot UV mask file along with the regular print file. Please note, the mask file must be vector art created in vector-based programs such as Illustrator. The Raised Spot UV mask file is used to show where the UV coating needs to be applied. Please only use solid 100% K (C 0%, M 0%, Y 0%, K 100%) to indicate where you would like the UV. Do not use shadows, glows or grayscale images. White will indicate no UV. What's the difference between Spot UV and Raised Spot UV? Spot UV is a flat finish of a shiny layer that goes on the exact spot where you would like your printed piece to have an area of a high gloss coating. Raised Spot UV is the same process, except the UV that gets applied stands out from the product, that if you run your fingers over the card you will feel the UV. The depth of the Raised Spot UV is 50 microns. What's the smallest size font I can use in my Raised Spot UV artwork? 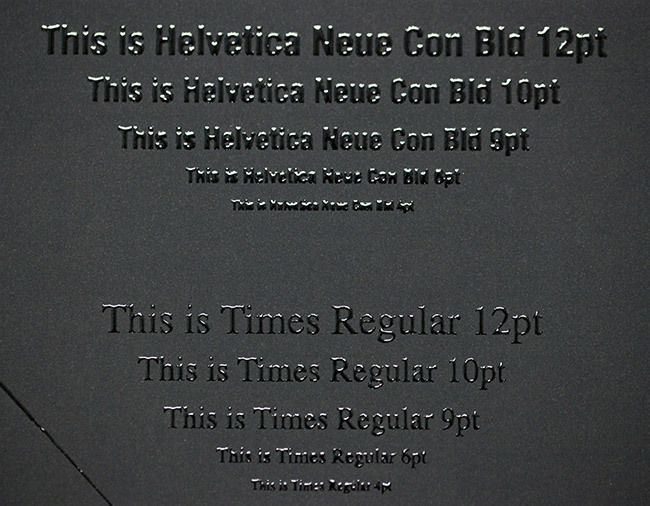 It is recommended that you do not use smaller than 6pt font on the Raised Spot UV Artwork. If, however, you use fonts with thicker strokes, it is recommended that you do not use smaller than 9pt font. How do I set up Raised Spot UV Greeting Cards? When designing a Raised Spot UV greeting card file, please make sure to leave the mask file at least 0.25" away from the scoring line to avoid varnish breakage and allow for easy folding. 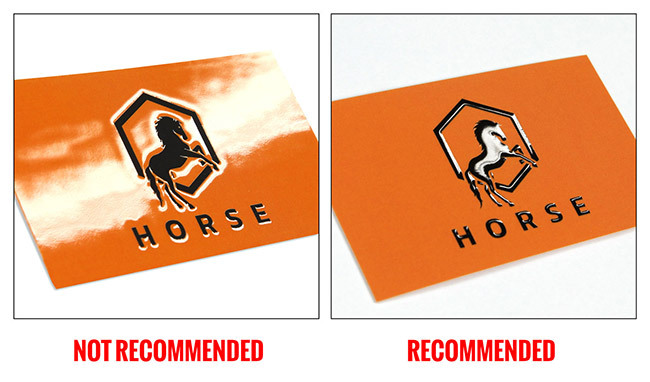 How can I ensure the best result on Raised Spot UV Cards? For best results, please make sure that UV coverage is less than 30%. Otherwise, the cards will be stuck together and become a block of cards. Also, The mask file must be a vector art created in a vector-based program such as Illustrator. Otherwise, you won't have sharp edges on the artwork. Up to 70% coverage is acceptable only with patterns, thin strokes or small shapes. Ideally, the size of the area, shape or image covered with raised foil should not exceed 1in x 1in. Please see the pictures below for reference.